Well, the excitement around here is never-ending (read into that as you will) and my last post An Easter Teaser was subsequently followed by an Easter Surprise! And it couldn't have come at a better time, given that we have been house bound due to my poor boy feeling very under the weather! 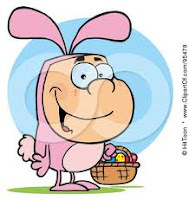 Just when he was feeling very hard done by being ill on school holidays the Easter Bunny, very cleverly disguised as a Fed-Ex guy, called unexpectedly to our house on Thursday. You won't believe what he delivered. @Blue Sky: Isn't he just!